NEW YORK (AP) — Carlos Garcia was three years into his first job in technology at Merrill Lynch when he first learned what a 401K retirement savings account was. He was floored when he learned that a colleague had already saved $30,000 in three years, and the company had matched it. The concept of making money off money was foreign to Garcia, an MIT graduate who was born in Texas to immigrants from Mexico. His story is not uncommon among U.S. Hispanics, who lag behind other demographic groups when it comes to saving for retirement. But for Garcia, the episode became the inspiration many years later for Finhabits, a bilingual digital platform designed to make savings and investment accessible for Latinos. Finhabits launched last year into a crowded world of robo-advisers, savings apps, online lending platforms and other financial-technology companies. But it is one of the few aimed at demystifying stocks and bonds for Hispanics, particularly young professionals who have the means to start investing but may have inherited a fuzzy understanding of the financial system from their immigrant parents. “Hispanics are very hard workers and we are able to generate quick income for our families. Sometimes we are good at savings but we put the money under the mattress,” said Garcia, who previously founded two other companies, including an internet analytics service for hedge funds. Other financial-tech startups aimed at Latinos have focused on immediate financial needs: paying off debt, building credit and gaining access to loans. Few besides Finhabits are dedicated to encouraging investing and long-term financial planning. Another is Mi Dinero Mi Futuro, a personal financial planning platform started by Ramona Ortega, a former New York corporate attorney who became preoccupied with the lack of financial literacy among Latinos while working in bankruptcy and securities litigation. Finhabits follows in the footsteps of robo-advisors Betterment, Wealthfront and Acorn, which use computer algorithms instead of a traditional wealth adviser to manage customer funds across various types of investments. Ortega’s platform is similar to more well-known personal finance apps Mint and Credit Karma; it offers personalized budgeting tools and recommendations for affiliated financial products. More than competing with established players, the founders of Finhabits and Mi Dinero Mi Future see themselves as creating a new market among Latinos, who they believe are overlooked by traditional financial institutions and even many of the digital newcomers. It is not an easy market to penetrate, however. According to a 2014 Prudential Research study, just 19 percent of Latinos had individual retirement accounts and less than 10 percent had investments in individual stocks, bonds of mutual funds. Only about 60 percent of Hispanics had a savings account, compared to 80 percent of the general population. The study cited various factors, including uncertainty among immigrants about what will happen to investments if they leave the country, distrust of financial institutions and difficulty understanding products. Another study, done in 2016 by the Pew Charitable Trusts, found that more than 60 percent of Latino workers lacked access to an employer-sponsored retirement plan, compared to 40 percent for white workers. 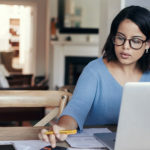 With Finhabits, beginner investors can start with $5 weekly contributions into traditional IRA, Roth IRAs or taxable investment accounts for shorter-term goals. Finhabits asks users about their priorities and risk tolerance and then recommends investment portfolios. The money goes into low-fee exchange trade funds from Vanguard and BlackRock. Through its app, blogs and text-messaging services, Finhabits explains financial concepts (portfolio diversification? It’s like ordering different types of tacos) and compound interest to persuade people that investing their money is safer and wiser than trying to “hit the fat one,” as Latinos refer to the lottery jackpot. Crucial to the Latino community, Finhabits lets users open an account with an Individual Taxpayer Identification Number, a processing number issued by the Internal Revenue Service for people who are required to pay taxes but do not have Social Security numbers. That makes the service accessible to immigrants who are not legal residents but still pay federal taxes. Savvier investors can simply set up accounts directly with Vanguard or BlackRock, which require more active knowledge of investing. But most often, those big players don’t have formal marketing strategies for Hispanics. Garcia said Finhabits has about 10,000 active clients who invest an average of $40 a week. It is signing up about 1,000 new clients each week and aiming for 50,000 by the end of the year. One challenge for financial start-ups is earning the public’s trust. Finhabits and Mi Dinero Mi Futuro are trying to that through partnerships with institutions already targeting minority and underserved communities. Finhabits is a provider in Washington state’s newly established Retirement Marketplace, which helps individuals and small businesses find low-cost retirement saving plans. Nearly 80 percent of the West Coast state’s 385,500 Hispanic workers are not covered by an employer-sponsored plan, said marketplace director Carolyn McKinnon. Finhabits also has partnerships with credit unions, including Neighborhood Federal Credit Union, which serves New York City’s predominantly Latino neighborhoods of West Harlem, Washington Heights and Inwood. Rosa Franco, director of lending at the credit union, said the partnership is still in development. She anticipates a challenge in marketing the service to her clients, many of whom are consumed by pressing concerns like debt repayment and or sending money to relatives abroad. “It’s difficult for many people to think about the future. They live paycheck to paycheck. Many people just think Social Security is their only option for retirement,” said Franco, who used the Finhabits app herself to open a Roth IRA. Ortega, who recently received a new round of investment from venture fund Backstage Capital for Mi Dinero Mi Futuro, crisscrosses the country giving workshops at universities and Hispanic professional organizations. At a financial boot camp in Los Angeles City Hall, Ortega won over Liliana Aide Monge, who moved to the U.S. from Mexico at age 5 and is now the co-founder of Sabio, web development and cybersecurity training company. Now a mother of two boys, Monge has used Mi Dinero Mi Futuro to budget her money, buy life insurance and open a high-yield savings account. “It was an eye-opening experience,” she said.